First the good news. 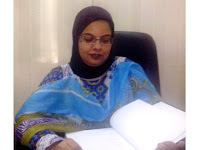 Mariam Sultana has recently received a PhD in astrophysics in Pakistan (tip from Anila Athar Hasan). She works in extragalactic astronomy and her research focuses on understanding the stability and the formation of Ring galaxies (Ring galaxies are actually quite awesome. You can see the image of one below. 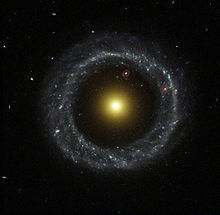 Some, may be most, of them are a result of a collision between two galaxies of different sizes. You can read about their formation here). This is a tough area of research and one of her PhD. advisors, James Binney, is one of the leading authorities in the field of galaxies and theoretical astrophysics. I used two of his co-authored books in graduate school, and both were tough and incredibly useful books (Yes, I still remember sleepless nights trying to solve problem-sets in Galactic Dynamics by Binney and Tremaine :)). So first of all, congratulations to Mariam Sultana!! Instead, she finds herself warding off the invective heaped on her and clearing the misconception that she has studied astrology, a pseudoscience which is considered haram. Her work was supervised by Dr Salakhutdin Nuritdinov, a professor at the National University of Uzbekistan. 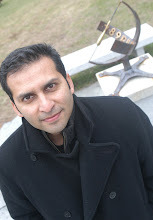 He was appointed in 2006 to FUUAST [Federal Urdu University of Arts, Science and Technology] through the Higher Education Commission’s (HEC) foreign faculty hiring programme. Dr Nuritdinov is a pioneer in the field and allowed Sultana to further develop mathematical models that he had created. “I didn’t feel worthy enough to do such high standard work,” said Sultana. “It was Dr Nuritdinov who led me all the way through.” In her thesis, she investigated the instabilities and physical conditions which gave galaxies their ring shape. Sultana was thrilled when two eminent professors agreed to become examiners for her doctoral thesis. One of them was James Binney, a professor of physics at the University of Oxford. He also heads the Peierls Centre for Theoretical Physics. The second examiner was Dr Ana Katrin Schenk, an assistant professor of physics and astronomy at the University of California. Dr Binney wrote to her and said that “[Sultana’s] thesis represents a considerable body of work, and from a technical aspect, it is surely worthy of a doctorate.” Sultana plans to pursue a postdoctoral fellowship in the United Kingdom. “But first I want to supervise all the PhDs which were left incomplete because of Dr Nuritdinov’s departure from Pakistan,” she said. She is currently supervising the doctoral students at FUUAST’s mathematical sciences department. Sultana did admit that there were many hurdles that she had to cross in order to earn her degree. During her studies, she found out that KU did not accept foreign supervisors unless they agreed to stay in Pakistan for at least seven years. Her supervisor only planned to stay in the country for four years. “I submitted the abstract of my thesis to the university in August 2006 and it remained pending for the next 22 months because of foreign supervisor issue,” she said. Sultana even approached the chairman of the HEC, who had advised her to ask Dr Nuritdinov to be her supervisor. “The authorities at KU did not even listen to him,” she said. Finally, in October 2008, her abstract was accepted after she replaced Dr Nuritdinov with Dr Shahid Qureshi, a Pakistani professor at the Institute of Space and Planetary Astrophysics. Two months before this happened, Sultana’s research paper was published in a Russian journal called “Astrofizika” (Astrophysics) and was later printed in another journal, Astrophysics. But after accepting her abstract, KU kept on insisting that she spend a year in the MPhil programme, as is the rule. Dr Nuritdinov admitted that he was not expecting Sultana to get the PhD because of “the bureaucratic behaviour and incompetence of upper-level academics.” He was pleasantly surprised when Sultana broke the news to him. Ultimately, this is a success story and I'm sure she will shine in her post-doctoral work as well. Best wishes to Mariam Sultana. Read the full article in the Tribune Express here. A few months ago, I had posted about another Pakistani astrophysicist, Nergis Mavalvala. See the earlier post: Pakistani, Queer, Woman, Astrophysicist: Journal "Science" highlights Nergis Mavalvala. Half of our effort in public outreach for astronomy in Pakistan is wasted in telling public the difference between astrology and astronomy. If there is a major celestial event in future, my worst nightmare would be to represent Pakistani astronomers on a forum (or a TV show) where the other guest is an astrologer. This is not entirely impossible in Pakistan, especially after the recent media hype of the claimed water-kit for cars by a pseudo-inventor. Dr. Atta ur Rehman, a very prominent scientist decided to participate in the argument. I do not support his successes or failures as the former chairman of HEC, but I appreciate his single handed effort to dismantle this fraud claim, which is apparently supported by many of the prominent scientists. The saddest aspect of this was...he was questioned by the semi-literate fake engineer for his credibility and contribution. Dr. Hoodbhoy made a very late entry into this drama through his Tribune(?) article, and is one of the very few sane voices against this scam. I agree with you and will post Hoodbhoy's article later today. That's correct. And I did not say that Mavalvala received a PhD from Pakistan. But she is another Pakistani astrophysicist (she grew up in Pakistan and came to the US for her studies...as I understand it.). I have made a few comics on this water-kit fiasco in Pakistan and have emailed to you as well. Hope you may find one interesting.